South-African Fiona Moodie wanted to write and illustrate children’s books from a young age and it is easy to see that she had the talent to fulfil her ambition. 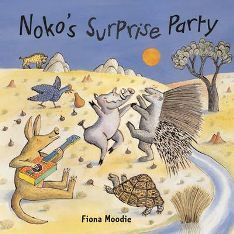 Her latest picture book, Noko’s Surprise Party, is a follow-up to Noko and the Night Monster. As Takadu the aardvark and Noko the porcupine have been friends for so long, it is only natural that Takadu wants to plan a party for Noko’s birthday, but it is to be a surprise. Takadu goes to considerable trouble to write and hand out invitations to Mrs. Warthog, Bat-eared Fox, Pangolin (a scaly anteater), Velvet Monkey and Guineafowl. The problems begin when Greedy Hyena sees Takadu deliver the invitations and realises that he has not been included because of his awful manners. He follows secretly when Takadu goes on a long journey to collect figs for the party. As Takadu is going back through the Dark Wild Wood, he meets Bushbaby and gives him one of the figs because he is so hungry. Leaving the wood, he comes across Mountain Tortoise lying on his back under the baking sun; he has to turn him the right way up and then give him a juicy fig to quench his thirst. Although his basket is now slightly lighter, Takadu is growing tired and decides to have a nap in the shade of a cabbage tree. Hyena has been waiting for his chance for revenge, and he gobbles up all but one of the figs that Takadu has collected. Poor Takadu is of course upset and angry when he wakes up and sees what has happened. He can smell Hyena and realises that he is the culprit. What will he be able to do to make sure that Noko still has a wonderful birthday party? Will Hyena live to regret his greed? Folk tales seem to have gone out of fashion, but this is a book that might reverse that trend. The ‘hero’, Takadu, is a delightful character who loves making up songs and manages to sing even when things are going against him. He is always eager to help his fellow creatures. Noko is another admirable role model who wants everybody to be happy on his birthday. Greedy Hyena, however, is the typical villain; he is understandably upset at not receiving an invitation, but his selfish way of taking revenge only leaves him feeling even more isolated at the start of the party. Children can learn some good lessons here about how behaviour affects the feelings of others as well as ourselves. The lessons, of course, come across in the most enjoyable and natural of ways. Most of the pages present just a few lines of text in a large, clear font under or alongside the illustrations. There are also a few wonderful double-page spreads where the text is superimposed on the picture, but the light-coloured backgrounds make for easy reading. This is essentially a book for reading aloud; it would not be the easiest one for a young reader to tackle, especially as there are one or two unfamiliar phrases such as ‘a calabash of marala berry juice’. For a gifted and confident young reader, the story would present an interesting challenge. Moodie is an illustrator as much as an author, and the pictures here make a huge contribution to the book as a whole. I find her style very original and delightful. It has a primitive feel to it and yet seems up to date at the same time. The animals – with the exception of Greedy Hyena, of course – always look so friendly and inviting. Landscapes range from the desert with blue mountains in the distance to the Dark Wild Wood where wide-eyed bats hang from branches. A map of the area spreads over both the front and back inside covers. Here, as well as the trees, rivers and rocks, we see charming scenes of Takadu playing a tune on his guitar for Noko, Velvet Monkey climbing the trunk of a palm tree, and Bat-eared Fox emerging from his hole. I had never heard of a pangolin before, but I think I might be able to recognise one now. This is a story that provides a great deal of enjoyment, complemented by delightful illustrations. It is a particularly good one to use as a basis for a drama session with young children. A whole-hearted recommendation. No Comments on "Noko’s Surprise Party"